Or at least make a valient effort! Extracts from a letter I sent to a kind Anchorage, Alaska resident. I am currently in the planning stages of my “once in a lifetime” ride along the Pan American highway. Hopefully I will arrive in Alaska towards the end of May 2014 and then begin the ride south at Prudhoe bay. I am trying to use the Warmshowers network to get as much information as possible about what I might need as I travel along the road. As you can imagine, coming from the United kingdom, I am travelling to a place that is completely unfamiliar to me and beginning an adventure that is way outside my normal limits. But such is life and a challenge is good. I am still researching online to find out about the region and route, but have a lot of unanswered questions and wondered if you could help? As a local resident, I am assuming that you have had other cyclists contact you on a similar subject and may be willing to assist me? First, I wondered if you might be able to host me for a few days when I arrive. (3-4 days?) Date to be confirmed, of course. I would like to spend a few days acclimatising as well as buying food and other things that I cannot bring with me on the flight. I will also need to arrange transport to Prudhoe bay, and wondered if you knew the most effective (cheapest but quickest) way to get there. Do you know what is more practical? A bus or plane. I will be arriving with my bike and equipment all boxed up for the long haul flight. Ideally I would like to assemble everything in Anchorage leave all the excess packaging in a recycling bin, then travel north with the assembled bike and bits. I cannot imagine what Anchorage is like as a city, though I guess I can buy all the groceries and extra equipment I need before I travel and my biggest uncertainty is your local wildlife! In England, our biggest wild animal is probably a Fox or a Badger or perhaps an errant cow! Alaskan fauna is a fair bit bigger and I guess I will need some sort of Bear spray, or other defence. Can you advise? Myself, I am a professional bicycle mechanic with over 20 years experience, and a very keen tourer. I would be happy to trade my skills for your knowledge should you need your bike fixing. While my plan is still in its preliminary stages and subject to change, but I hope you can find a few moments to advise me and help me achieve what is a lifetime ambition. Hey Matthew, sorry for the late reply. So I can't host you, but it shouldn't be that hard to find someone that can host you, I haven't heard of anybody not finding a host. Also consider using couchsurfing for a host since it is much more popular in Anchorage than warmshowers. I do have advice for you and your trip. Yes, the road only goes to Deadhorse where there is a gate. They run tours from there to the actual ocean, which is maybe like 30 miles away. I don’t know how far in advance you have to book or if you can just show up, I’d call. The French Canadian guy, Frantz, got a ride to the end and rode back and it took him 6 days. The first 80-90 miles out of Fairbanks is paved I believe and mild grades (Grades in AK are lower because of the snow and ice in winter it is rare to encounter greater than 7% grade) After that it’s all dirt rd. Some of the passes in the Brooks Range are steep like 12%. Frantz said it was one of the only places he had to walk his bike in his whole trip (he’d started in Ushuaia and rode up through south America up to Fairbanks). The 60 miles or so at the end of the Dalton are all flat though. Yeah you want a water filter, and pretty much all your food. I doubt there’s more than the most minimal gas station food at the few buildings along the road and everything will be like 5+ times as expensive as it should be. Ok, in AK the highways aren’t referred to by number but by name, Highway 1 North of Anchorage is the Glenn Hwy, Highway 4 is the Richardson Hwy, Highway 2 from Delta Junction to Fairbanks is the Alaska Hwy, Highway 2 North of Fairbanks is the Elliot which turns into the Dalton Hwy, Highway 3 is the Parks Hwy, and connecting Cantwell to Paxson East-West is the old Denali hwy. I’ve biked the path you’re thinking of taking from Anchorage to Fairbanks except I went all the way to Tok instead of taking the Richardson at Glenallen. The way you’re thinking is considered the scenic route to Fairbanks from Anchorage. Now in AK once you make it past Palmer and Wasilla (north of Anchorage) you can camp basically anywhere you want it’s almost always public land and pretty much no one will bother you. There is not extensive fencing associated with agriculture as there is in the states, most places off the road system you can pull off and start hiking and no one is going to bother you; it’s free reign kinda land. Once you pass Palmer on the Glenn hwy you have like 35 miles of continuous hill climbing it’s pretty tough. Things level off at about Sheep mtn (about mile 103ish it has distinct mineral bands in it). There is Matanuska glacier to the right and you can actually access the glacier pretty easy, you have to pay like a $20 toll (because the land in between the road and the glacier is private) but it’s only like 3 miles max off the hwy and you can walk right up on it and it’s massive it extends back at least 15 miles to 11,000-13,000 ft. mtns (you’re at like 2,000 ft elevation at the glacier so major relief). I thought the Mentasta mountains were beautiful, a very intimate remote feel. 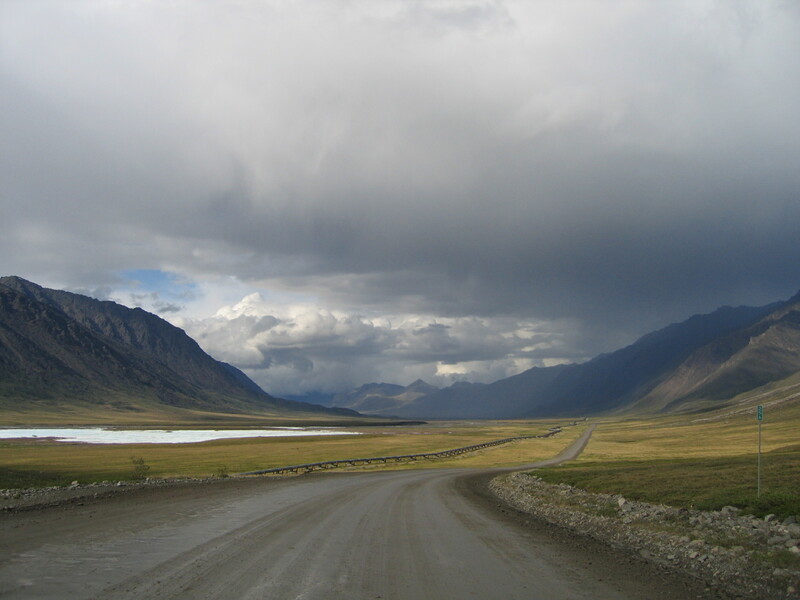 The interior of the state, north of the Alaska range is much more homogenous in appearance than south central Alaska and there is less mountain scenery. only the Dalton, the 50 miles from the Richardson to McCarthy, the old Denali hwy, and the 80 miles or so from the Alaska hwy and Eagle are the only dirt roads in AK. The Dalton apparently is really dusty or really muddy and I've heard they apply some sort of substance on the road up there that is really corrosive to bike parts. Frantz had to replace his bearings and chain after that section, though he had biked a long way prior to that section and that surely made a difference, also he said you're cleaning mud out of your chain constantly up there. It's a narrow 2 lane road with a lot of traffic 160 semi trucks a day on average in the summer. Up in Prudhoe Bay expect weather between -10 to 10 celsius and rainy. There is potential to be caught in a snowstorm that prevents you getting over Atigun pass. You'll have to over pack on clothing to be safe in this area at that time of year. July is what I tell people is the best bet for weather, although this is for south central Alaska I don’t pay attention to the way far north. Up on the Dalton be prepared for rain, not pounding thunderstorm rain like in the Midwest, it’s more of a drizzle, but it will be cold like 40 degrees. Like you need to watch out for hypothermia, and protect your hands or they might get so cold riding even if you’re body temp isn’t that bad, so that you’re too clumsy to set up your tent and then that extra time exposed with a low activity level gets you. There’ll be no trees or bushes to hide behind up north; it’s a lot like the desert except it’s a mat of soggy green tundra replacing sand. Both are otherwise very broad, open and exposed expanses and you'll have to deal directly with any wind or weather out there. You will have infinite sunlight up north you can bike as long as you want, so you can do really big days if you are fit, but it will also be bright in your tent so I bring a head band to cover my eyes to help with sleep. I’ve never heard of electric fences in campgrounds in AK. Up near the Dalton I’d be surprised if they got 50 people a year using some the few campgrounds that are there. It is almost entirely truckers going up to the slope in one shot, or tour buses taking people up to the slope in one shot. The campgrounds are probably just an outhouse and maybe a few fire rings next to a little parking strip. The bears are not socialized to people up there, and animals up north tend to be quite skittish around people, perhaps due to all the hunting up there. There are no trees that you can really hang your food up in, but they have hard plastic canisters to put your food in that are bear proof (but they’re like $100 and bulky like a basketball). I’d be more concerned about ground squirrels or foxes eating your food if you leave it out (this happened to me once). Honestly I’d probably leave the food in my tent, it’s unlikely anything would happen, but the worst case scenario is about as bad as it gets. I wouldn’t camp near streams and make sure that there are no berry bushes near where you camp and you should be good up north. Always keep you bear spray at hand even when you're biking though just in case. Also don't cook or eat near your tent or leave smelly garbag or opened containers near it like do it at least 50 yards away. Packaged unopened food shouldn't be a problem for the brief time you're there. Bear spray is widely available and keep it on you even when you bike as I've heard of bears chasing lone bikers just out of curiosity as a game like a dog. I don’t like it; I prefer just to cover up and it’s usually cold enough that extra layers won't bother you. If you can keep like 10+ mph speed the mosquitoes shouldn't bother you when riding. The mosuitoe’s don’t carry diseases up here, so its not a health concern if you get bit. That said they’re everywhere at all times you are going into areas famous for being terrible with bugs, like if you left a bare patch of skin open and didn't move eventually that patch of skin would be completely covered with mosquitos so that you couldn't see your own skin through them. Also deet won't work for black flies. I would bring a head net and some 100% deet as a back up (like if you have to take of a layer briefly). Also you might want to bring ear plugs for sleeping because often there will be a buzz like an electric motor from thousands of mosquitoes buzzing around your tent at night, especially if you're in a marshy area, it's mostly marshy on the Dalton highway. Anchorage has all the supplies and is the cheapest place to stock up. Fairbanks also has a bike shop and most things. Anchorage and Fairbanks are like 600km apart, so watch that. It's impractical and heavy to carry too much food, but expensive gas station food is the only other alternative through out Alaska, the Yukon Territory and northern British Columbia. You can definitely pull off the trip through Alaska and Canada in fact it is the easiest up here. The people are friendly, the roads are relatively untrafficed, and you can camp anywhere safely and without harassment. From Fairbanks to Whitehorse, (~1300km) there is nothing but gas stations every 100-160km. Whitehorse has a bike shop. Dawson city is a great place to visit up north and is really happening in the summer. Go to Jasper and Banf in british Columbia, see the Canadian Rockies, but also double back and see Whistler and Vancover B.C. Stay with Jon and Joan Jones when you visit they are great. Follow the pacific coast as closely as possible down through the U.S. at least through Big Sur then cut east and see the Sierras and the Grand Canyon. I hope that helps, I can answer more specific question, or clarify information as I mostly copy and pasted it from another message. It's cool you're planning so far ahead. Good Luck Matthew. Many thanks for the VERY detailed reply. I really appreciate your effort, cut and paste or not! I am going to slowly pick through it, but there is a lot of good information there. Yes, I do like to plan ahead, but mainly in this case its because I am travelling to completely the other side of the earth from my point of view. I will be WAAAY out of my comfort and familiarity zones. Its going to be a massive shock to the system for me, so the more research I can do in advance, the better. I know its not going to be an easy trip and I have read many reports saying its tough, but I relish the challenge. Once again I appreciate your efforts and hope you wont mind if I ask you other questions in future? Many thanks and kind regards.